LONDON--(BUSINESS WIRE)--As the World Cup inches towards its conclusion this Sunday, football enthusiasts around the world are speculating which finalist will lift the iconic trophy. France, after twenty long years, is once again in a position to repeat history with the refrain “We are the champions” ringing strong in the minds of every supporter. Croatia, on the other hand, began its world cup journey in 1998, only to lose momentum over the years. However, this world cup has seen team Croatia rise out of oblivion to emerge strong and confident. The 2018 World Cup has been full of many surprises, but the formula for success remains largely the same, which comprises of sticking to the basics of hard work, persistence, and teamwork. In the business world too, success favors those who consistently strive for excellence while sticking to the basics. Market research firm Technavio has identified two winning industries, which have made an indelible contribution to the success of the 2018 FIFA World Cup while making a positive impact on their bottom lines. 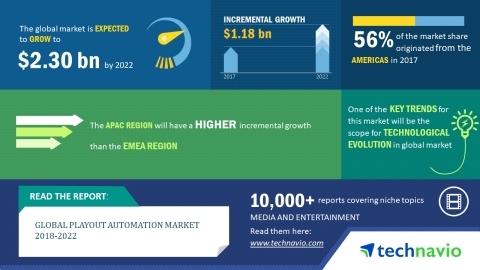 Technavio researchers estimate the global playout automation market to generate a revenue of USD 2.30 billion by 2022. The mandatory digitalization of TV channels in most countries and the increasing migration process from standard definition (SD) to high-definition (HD) content has fueled the growth of the global playout automation market. Besides digitalization, the rising number of channels is another major factor driving the growth of the market. The demand for multilingual playout has gained significant demand due to the wide audience base and growing penetration of satellite and cable TV in rural areas, particularly in Asian countries. In 2017, most TV service providers offered multilingual playout for various channels with the use of CiaB, which further automates the playout process based on input files. CiaB also assists in inserting multilingual regional-specific commercials during playout. For instance, people across India were able to enjoy the world cup telecast in regional languages such as Bengali, Tamil, Kannada etc. The global payment security software market is expected to grow at a CAGR of 16% during 2018-2022. The global payment landscape is transforming due to rapid technological advances and increasing investments towards improving the capabilities of digital payment systems. Consumers are adopting devices connected to the internet for online transactions. Digital payments comprise of online, mobile, and contactless cards. Online transactions are gaining prominence as they are efficient and convenient when compared to traditional methods of financial transactions. Digital payments have become an integral part of e-commerce; hence, the digital transformation of payment methods will drive the growth of the global payment security software market. Confidence in the payment security market has led to ease of transaction in just about every sphere of the consumer industry, which has leveraged the popularity of the FIFA World Cup, be it airline tickets, game passes, restaurants, books, sports memorabilia, and many more. As we await the finale of the FIFA World Cup to celebrate with the winners, these two industries have already been rewarded with a big share of the pie. Technavio highlights few industries that will register a positive growth in line with the ongoing 2018 FIFA World Cup.